Oh… and two more things! A fourth one will follow in issue # 101 of Game Trade magazine, which will be available at your local retailer in July (and eventually posted here online for those of you living abroad or without easy access to a local game store).And on a separate note… to celebrate the release of the first User Pages, and encourage you all to migrate (or develop new!) 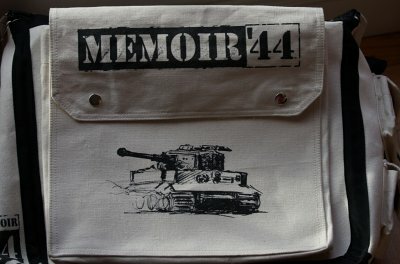 Memoir ’44 content for them, in the coming month we will select the best User Page in each language and give its author a special, not-available-in-stores, Winter version of the upcoming Memoir ’44 Campaign Bag, featuring a Tiger tank on its front flap! This entry was posted on Friday, May 16th, 2008 at 17:45 and is filed under BattleLore, Games, Memoir'44, News. You can follow any responses to this entry through the RSS 2.0 feed. Both comments and pings are currently closed. I don’t know, maintaining my website is plenty of work for me. While I certainly will be profiled on my User Page as well, I have a feeling that there are some creative people out there who just don’t have the access to a website like I do. And now they do! So I look forward to seeing what folks produce. So when you say in every Language you mean English French and German, right? Weel I really hope you’ll release the Air pack revised scenarios on the website soon. The Air Pack booklet isn’t holding up as good as I hoped too. I just got the Air Pack a month ago (Greece 🙁 ) and I have allready played 24 of the scenarios. I meant French and English, primarily, since no version of Memoir ’44 is available in German. But we reserve the right to change our minds if we see some really good contribution in German. As for the Air Pack scenarios, they will be available when we release the next, completely revamped, versions of the scenario editors for M44 and BL, not before, because they require version support which the current editors can’t handle.